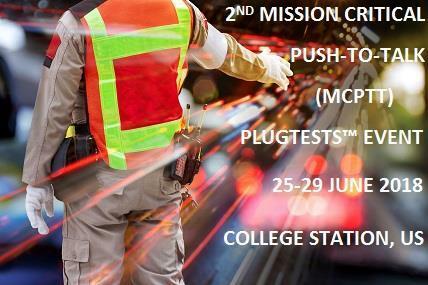 ETSI, with the support of TCCA, PSCR, Texas A&M University (TAMU), and the European Commission, will hold the second of its MCPTT Plugtests events on 25-29 June 2018 in College Station, Texas, USA. The event will be hosted by TAMU and – according to ETSI – will be the first time that mission-critical push-to-talk (MPCTT), MCData and MCVideo products and services have been tested for interoperability in the US. ETSI states that attendees will benefit from assessing the level of interoperability of their implications, validating their understanding of the standards, testing many real implementations, demonstrating end-to-end interoperability, and debugging their implementations at an early stage – thereby saving time and reducing costs. It adds that by attending the event, they will also be promoting MCPPT technology and its supporting ecosystem. If your organisation is interested in attending the MCPTT Plugtests event, you can register here – please note that registration is a requirement for attendance, the registration deadline is 15 March and that ETSI highly recommends registering early so that pre-testing can begin as soon as possible.